The Ancona brand is a quality/price benchmark for Italian designed bathroom and kitchen products, bringing you the benefits of styling, manufacturing and performance excellence as cost-effectively as possible.Add an elegant and useful restaurant flare to your kitchen with the Ancona Stainless Steel backsplash with Shelf. The smooth, durable finish provides easy clean-up from cooking splatter and blends well with any style expression. The built-in shelf with ledge provides easily accessible storage for your spices and garnishes and the hanging bar allows you to keep your favorite cooking utensils at your fingertips. This backsplash is available in 30 and 36 wide; and is very easy to install! This optional backsplash for GE Cafe ranges measures 3-inch deep, 4-inch high and 30-inch wide. Stainless steel backsplashes 304 #4. 30 inch. Simple and fast installation Ideal for new-generation slide-in stoves. 30 inch x 30.75 inch Stainless Steel Backsplash with Stainless Steel Shelf The Ancona brand is a quality/price benchmark for Italian designed bathroom and kitchen products, bringing you the benefits of styling, manufacturing and performance excellence as cost-effectively as possible.Add an elegant and useful restaurant flare to your kitchen with the Ancona Stainless Steel backsplash with Shelf. The smooth, durable finish provides easy clean-up from cooking splatter and blends well with any style expression. The built-in shelf with ledge provides easily accessible storage for your spices and garnishes and the hanging bar allows you to keep your favorite cooking utensils at your fingertips. This backsplash is available in 30 and 36 wide; and is very easy to install! 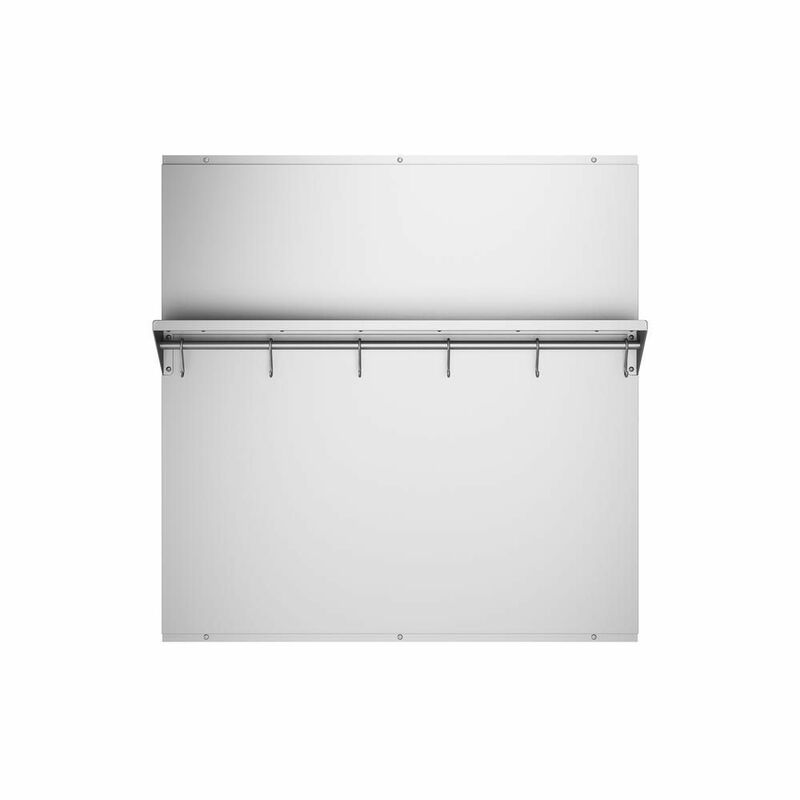 30 inch x 30.75 inch Stainless Steel Backsplash with Stainless Steel Shelf is rated 4.6 out of 5 by 43. Rated 4 out of 5 by Appledumpling from Looks good! Looks good and protects the backplash and easy to keep clean ! Rated 3 out of 5 by Oxley from Easy Installation I love that the product was easy to install and looks great but you can see the “supports” in the back. The sheet does not look even in the front as you can tell exactly where the lines are. Rated 3 out of 5 by BR549 from The dimensions are not that advertised. The actual dimensions are... The dimensions are not that advertised. The actual dimensions are 29-1/2” x 29-1/2”. Rated 5 out of 5 by Terry58 from Very happy I had been searching for a backsplash. I made the purchase of this backsplash and have been pleased. It was very easy to install and looks great. Rated 5 out of 5 by uncle B from Great product at good price. Glad that we found this product. Not easy to find one, particularly at this price. However, I would prefer it to be 30" or even 30 1/8" for exactly the same width allowed to fit in the 30" range. Rated 5 out of 5 by SamD from Backsplash Good fit and excellent price for decent quality as expected from a recommendable company.